Savings habits are hard to establish. Hard like when you first decide to not order soft drinks in restaurants and order water to save a few dollars, or deciding to only fill your gas tank according to the gas app on your phone. You will forget! You'll be half way to filling your tank before you pull your phone out. Or your waitress will walk away to get your $2.56 drink before you can realize that for your family of 5, you just blew $13 on 60 ounces of "who cares". It will take about 90 days to get to a point where you always remember to check your phone app before going to the grocery store. We have spending habits that work the same as our savings habits. Yet, this is the future of coupon clipping. It's time to serious about saving money with your phone and computer. You will need to have your apps loaded and clipped so you can redeem all your digital dollars. Yo may be wondering if it's worth it. It is worth it! There are hundreds of offers on apps like Ibotta for products you purchase each week. HUNDREDS. 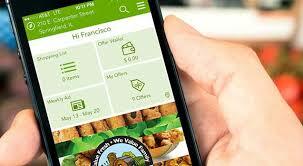 Your My County Market App has items that are not commonly found on traditional coupon sites. Look for produce coupons on both apps. I've saved on tomatoes, bananas, even garlic. I have been buying salad kits for the family weekly off the County Market app. You definitely can save extra money with the apps, no doubt about it. You'll need to establish this habit so that it becomes part of your routine. To do this, you need to connect it with another habit you already have established. For example, is there a habit you have on Wednesday that allows you a few minutes to prep your phone? For me, it's Wednesday morning after the kids are set to school. I have a window of about 20 minutes before my day begins. This is when I make a cup of coffee and check my daily to do list. This is already my routine, so I'm going to tie this new behavior to an old one. After coffee, and with my to do list review, I will click on the apps and put digital coupons in my wallet. It will only take a couple minutes, but it will be set before I reach the store. That's it! It's on Wednesday, the first day of shopping week, and when offers are renewed. It fits with my already scheduled routine. And, it will save me money and become a new habit. Wednesday is your best bet for establishing a new savings habit. Try to find an already existing habit on this day you do every week. Look for habits like picking up kids from soccer practice, lunch plans, favorite TV show schedule. Before you know it, your app shopping will be second nature.